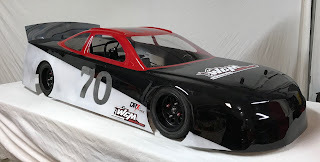 Indy Quarter Scale Racers: Big news from WCM for the season opener! Big news from WCM for the season opener! WCM is a leader in the Quarter Scale industry and IQSR is proud to be the home track of WCM! WCM Racing is giving away a new 2017 WCM Storm HD Body to the winner of the Sportsman and Limited Sportsman Class for the season opener this Saturday at Ingalls Motor Speedway! Thank you to WCM and check out all their inventory at wcmracing.com!